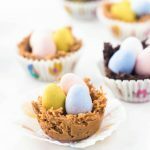 These No Bake Easter Egg Nests only use 5 ingredients and are healthier, using shredded wheat and natural peanut butter. They’re a quick, easy and delicious Easter dessert. In a large bowl combine coconut oil and peanut butter chips and microwave on high heat for 1 minute. Check to see if chips are melted, if not, stir and put back in microwave for 30 more seconds. While the peanut butter chips are melting, smash 1 1/4 cup of shredded wheat cereal in a zip-lock bag (or use your hands). Once the peanut butter chips and coconut oil are melted, mix in peanut butter. Once combined, add in shredded wheat and mix until shredded wheat is coated in peanut butter mixture. Using a cookie scoop or a tablespoon, scoop out nest contents into the mini muffin tin. Use the back of the scoop to press a small divet into the center of the nest. Place the chocolate candied eggs in the center and refrigerate to harden. Refrigerate until 10 minute prior to serving. If you prefer chocolate, swap out peanut butter chips for chocolate chips. I have not tried using a regular sized muffin tin with this recipe, but I’m sure it would work. You would just have less nests. I used a natural (aka drippy) peanut butter for these nests. If you don’t have chocolate candy eggs, M&M or chocolate chips would also work!